A medical illustration is the best method to communicate clearly medical or biological information with both professional medical communities and a broad audience. An illustration or animation is intended to show and clarify a complex theme in ways that words alone unable. Using a software tool to create a medical illustration is the best option, as illustrations will be easy to optimize for use in digital formats for use in printing, websites, slide-show and even turned into animations. Ability to create medical and healthcare illustrations with ConceptDraw DIAGRAM is delivered by the Human Anatomy solution. 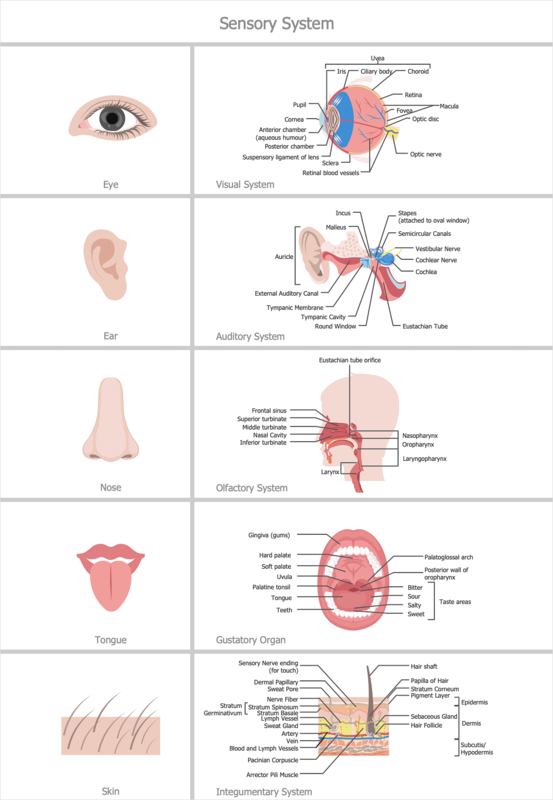 This solution extends DIAGRAM with 2 stencil libraries containing 66 vector objects that can be used when making different visualizations containing human body parts pictures. ConceptDraw DIAGRAM with the vector drawing tools extended with samples and libraries of the Human Anatomy solution is the ideal medium for creating designs of this type. Select the Human Anatomy solution from Solutions panel. You can add a text to your drawing using the text tool. Result: Human Anatomy solution is the best tool to design the most easily varied diagrams and illustrations for using in a sphere of medicine and health care.